A massive geyser of steam and debris that erupted through a midtown Manhattan street left asbestos in the dust that settled, but city officials said Thursday that tests indicated the air was safe. The city's Office of Emergency Management said in a statement that long-term health problems from the rupture of the 83-year-old steam pipe and its debris were "unlikely." "We will be going over every street," Mayor Michael Bloomberg said. "We'll be checking the air. We'll be checking what's on the ground." Streets were still closed Thursday morning around the crater left by the eruption near Grand Central Terminal, creating near-gridlock during the morning rush. New Yorkers streamed down Park Avenue, some wearing masks to filter the air as they weaved around utility trucks amid the sound of jackhammers. Clumps of office workers, BlackBerries in hand, huddled on corners for word on whether their offices would open. "I'm mostly calm and collected," said Tony Vcaj, 26, who was outside his closed building at 42nd Street and Third Avenue. He was trying to reach his boss to figure out the day's game plan. Officials determined that buildings near the explosion site are structurally sound, but OEM told CBS station WCBS-TV that people who work in the area will not be allowed into the area, dubbed the "frozen zone," between East 40th and East 43rd streets and between Third and Vanderbilt avenues. The loud, rumbling eruption began shortly before 6 p.m. Wednesday, breaking windows and rattling buildings as the pipe spewed steam, dirt and debris hundreds of feet into the air. One woman died of an apparent heart attack, and about 30 people were injured, four seriously. Officials quickly ruled out terrorism as the cause of the blast, but for some witnesses, the explosion, dust and chaos were frighteningly reminiscent of the scene on Sept. 11, 2001. "We were scared to death. It sounded like a bomb hit or a bomb went off, just like 9/11. People were hysterical, crying, running down the street," said Karyn Easton, a customer at a salon a few blocks from the site of the blast. "It was really surreal." City crews worked overnight to assess and repair the damage and to determine what happened. Most subway service was restored, though most of the trains were passing Grand Central. 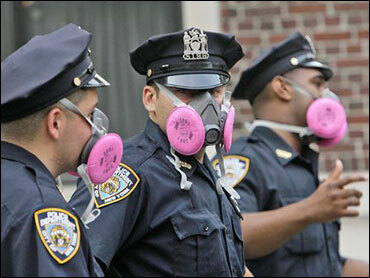 On Thursday, asbestos contamination was the main lingering health concern, Bloomberg said. Some of the pipes that pump steam beneath the city to heat and cool thousands of buildings are wrapped in asbestos, which can cause cancer and other serious illnesses with prolonged exposure. Area residents were urged to keep windows closed, and anyone exposed to the falling debris was instructed to wash carefully and isolate the clothing they were wearing in plastic bags. Eight air samples in the area around the explosion found no sign of asbestos, but six of 10 samples of debris and dust came back positive, the emergency-management agency said Thursday. City engineers also warned that up to six feet surrounding the giant hole might be in danger of further collapse, and officials said workers would not be allowed into office buildings in a zone that covered several blocks. Officials said the steam pipe might have exploded under pressure caused by an infiltration of cold rainwater, or it might have been damaged by a water main break. Con Edison head Kevin Burke said the site had been inspected hours before the blast as part of a routine response to heavy rain that flooded parts of the city. He said crews had found nothing as they searched for steam rising from manhole covers or cracks in the street — indications that pipes could be in jeopardy. The steam systems are normally inspected every six weeks. It was rush hour Wednesday evening when the geyser erupted, generating a tremendous roar as 200-degree vapor sprayed as high as the top of the nearby Chrysler Building. Steam and dirt boiled from the ground for hours. Several people were struck by falling chunks of asphalt or rock that had been blasted out of the ground. Mud covered others. A woman who was bleeding heavily was helped by police while a man lay on a stretcher in the street. When the steam dispersed almost two hours later, a large crater was visible in the street and a red truck lay at the bottom of the hole. Two city buses and a small school bus sat abandoned and covered with grit in the middle of Lexington Avenue. The steam pipes have ruptured before. In 1989, a steam pipe explosion near Gramercy Park killed three people and spewed loads of asbestos into the air — a fact that Con Ed later admitted it concealed for days while residents were exposed. That explosion was caused by a condition known as "water hammer," in which water condenses in a closed section of pipe. The sudden mix of hot steam and cool water can cause pressure to skyrocket, bursting the pipe. Authorities Thursday couldn't immediately account for how the most seriously wounded victims of the latest eruption were hurt. Police said the woman who died, identified as Lois Baumerich, 57, of Hawthorne, N.J., suffered cardiac arrest. She and 15 other people were taken to Bellevue Hospital, where two seriously injured patients were being treated in a trauma unit, hospital spokesman Stephen Bohlen said. Two other people were in critical condition at New York Weill-Cornell Medical Center, said hospital spokeswoman Emily Berlanstein. Among the injured were several firefighters and police Officer Robert Mirfield, who helped evacuate 75 people trapped in a nearby office building by cutting open a gate, authorities said.